Gabrielle Plucknette/The New York TimesA list of your forbidden words in the office of Hugo Lindgren, editor of the magazine. 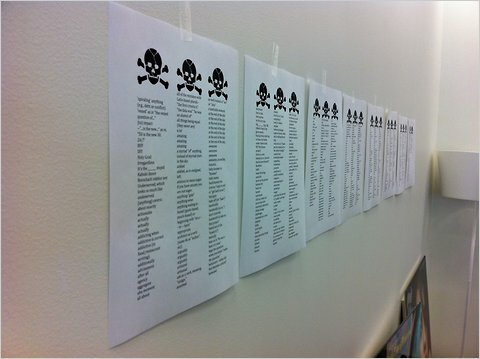 The Times magazine staff enjoyed readers’ response to our post about Kurt Andersen’s “Words We Don’t Say” so much that we posted an unabridged list of your suggestions on our office wall. It is, however, not all that practical. If we ceased to use all the words that readers don’t want us to use, we might publish a blank magazine. Some of your explanations were erudite. Others were downright funny. We know one thing: We will never use impact as a verb ever again. anxious to mean eager. If you have anxiety you are not eager. architect as a verb (same ilk as “author”, etc). behaviors – when did that become a plural? enormity instead of magnitude, large scope, etc. graduate high school, college, etc. headlines that begin with “Whither …”. meet up – does this mean something like “meet”? need to when have to, ought to, should are hanging about unused. pleaded: the nuns always pounded “pled” into me until I bleaded. prior to or subsequent to. The English language gives us “before” and “after.” Use them. redouble – that’s quadruple, right? revolutionary: What happened in Egypt was a revolution. Lady gaga definitely isn’t. tap into – isn’t “into” built in? underserved, which looks so much like undeserved. with regard instead of …..in regards.